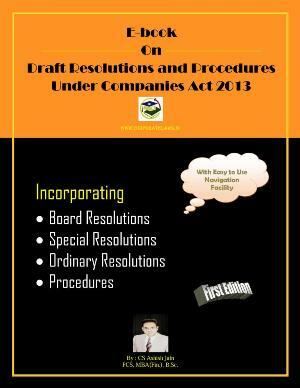 As per the provisions of Section 123(3) of Companies Act, 2013 the Board of Directors of a company may declare interim dividend during any financial year out of the surplus in the profit and loss account and out of profits of the financial year in which such interim dividend is sought to be declared, Provided that in case the company has incurred loss during the current financial year up to the end of the quarter immediately preceding the date of declaration of interim dividend, such interim dividend shall not be declared at a rate higher than the average dividends declared by the company during the immediately preceding three financial years. "RESOLVED THAT an interim dividend of __% (i.e.Rs.___ per share) amounting to Rs._______ be paid out of the profits of the Company for the F.Y. ________ on the equity shares to those share holders whose names appear in the Register of Members of the Company on ________." "RESOLVED FURTHER THAT a Bank Account Styled ________ LIMITED (INTERIM DIVIDEND) ACCOUNT 20__-__ be opened with _________ Bank and a sum of Rs.________ being the entire amount of interim dividend, be transferred to the aforesaid account on or before fifth day of the approval by the Board for payment of interim dividend." 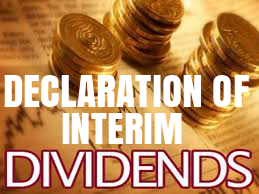 "RESOLVED FURTHER THAT the dividend warrants be printed with the facsimile signature of Shri _________ of the company and that the Bank be and is hereby instructed to honour all dividend warrants presented for payment, containing the facsimile signature." "RESOLVED FURTHER THAT the amounts remaining unpaid on the dividend account be transferred to UNPAID INTERIM DIVIDEND ACCOUNT 20___-___ . 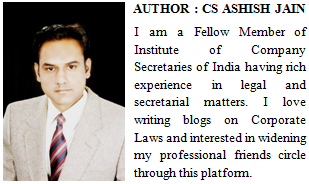 "RESOLVED FURTHER THAT Shri __________ of the company, be and is hereby authorized to take such steps as may be necessary, desirable or expedient to give effect to this resolution.